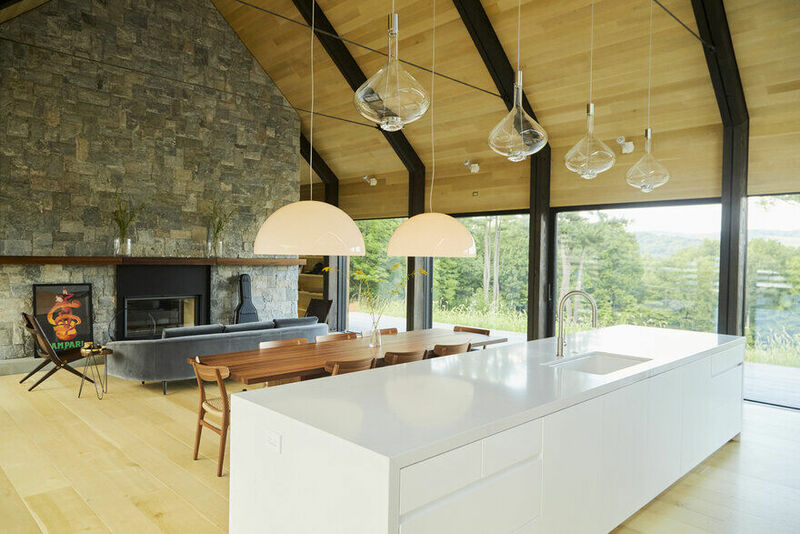 Amalgam Studio’s stunning light-filled new house for a single family is a modern take on the local, historic barns of the Hudson River Valley. 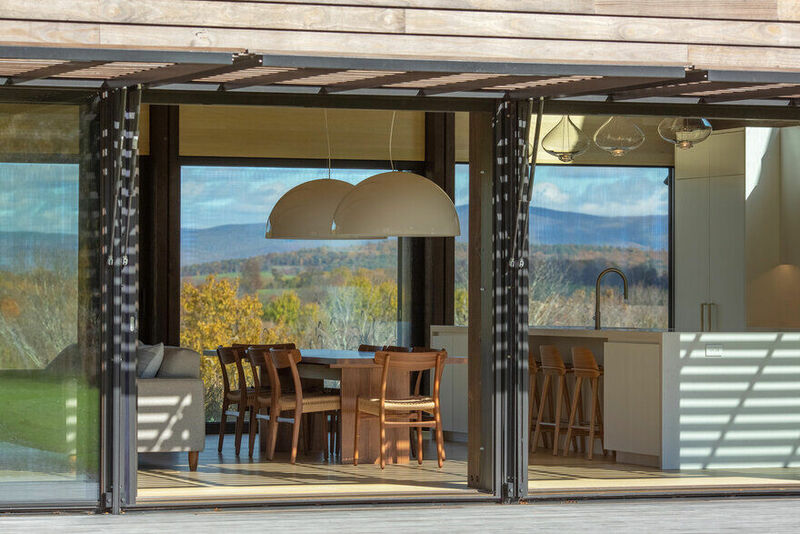 The recently completed 3 level, 4 bedroom house for a young family sits atop a mountainside on 120 acres, near the quaint village of Rhinebeck in upstate New York, and is designed to adapt over time from a weekender to a full-time residence. 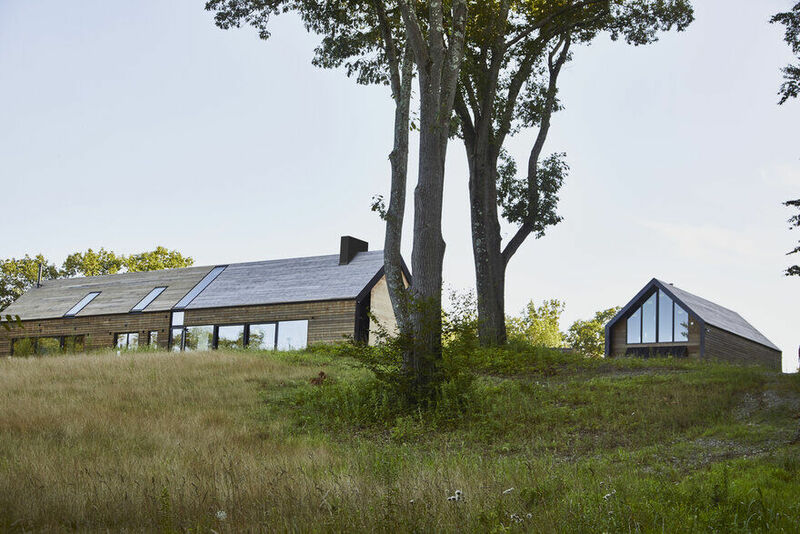 Inspired by the rural setting, a long linear barn-like main house and a secondary carriage-house, were placed around an open field and swimming pool, reminiscent of traditional farmstead arrangements. 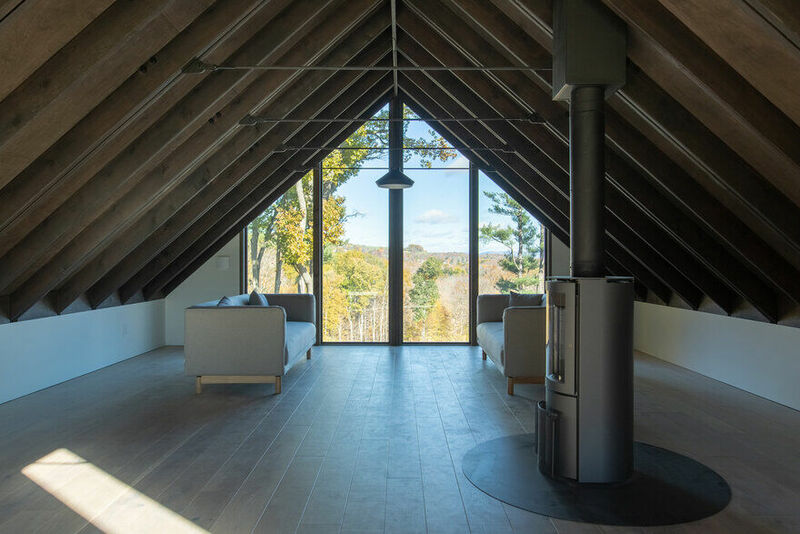 Encompassing over 5,000 square feet (465 sq m), the main residence features airy rooms, ceilings with exposed timber beams, natural light throughout, and carefully defined views that help celebrate the ever-changing seasonal landscape. The main residence is visually and functionally divided into public living and private bedroom areas by a central feature staircase of floating treads and full-length skylights overhead. On the ground level, one side contains two children’s bedrooms and a master suite. The other half encompasses a den, living room, dining area and kitchen. The living areas utilize 8ft by 8ft sliding glass doors leading directly onto decks for outdoor entertaining. Downstairs is a full basement containing media room, games room, wine cellar, study and guest suite. 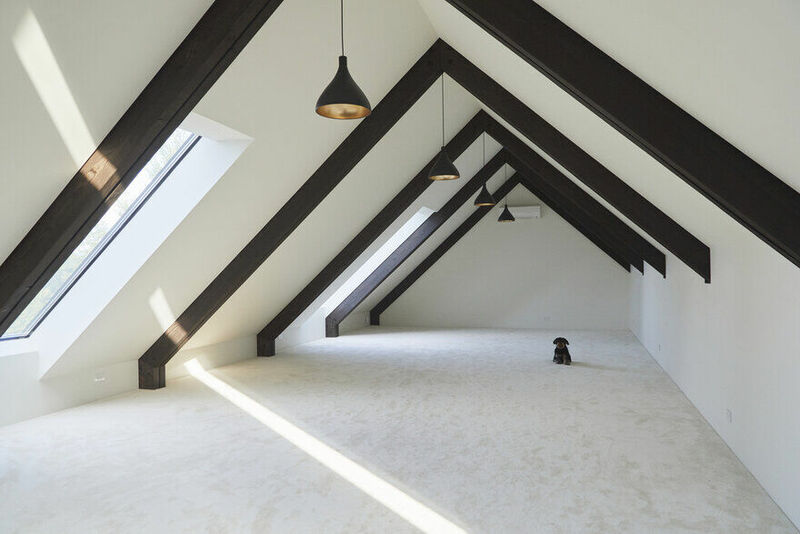 Upstairs is a bright, white, minimal multi-functional loft space lit by several skylights. The nearby, detached Carriage House comprises a 3-car garage, storage and workshop on the ground level, with an adaptable music room and studio space upstairs. 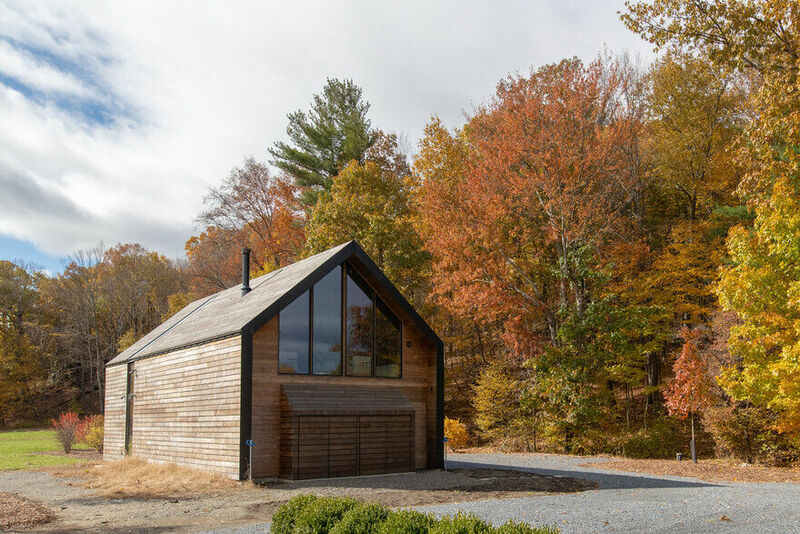 Conceptually the Silvernails house design evolved from the architect’s research into three historic archetypes : the New World Dutch, 3 Bay English and New England Barns, all built throughout the area during the 18th and 19th Centuries. 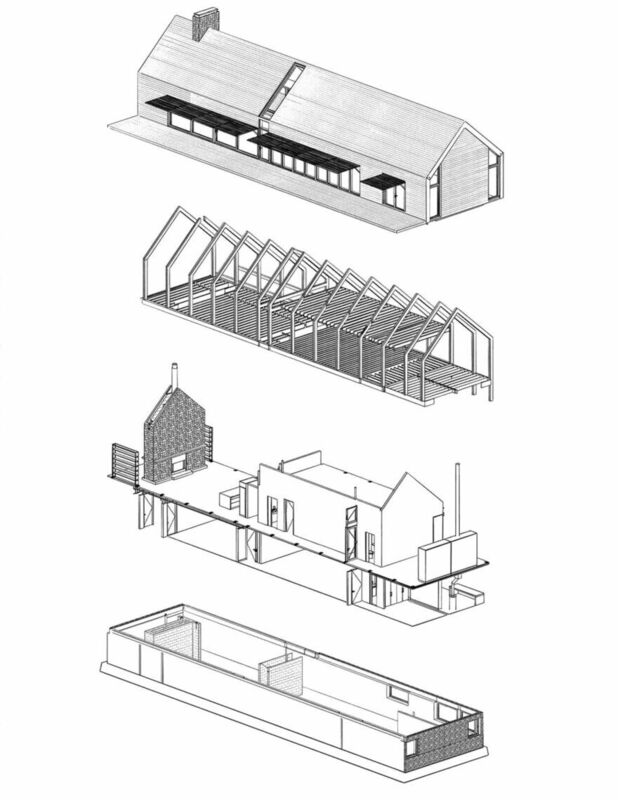 These archetypes helped inform the strong gable form, interior planning and overall massing. 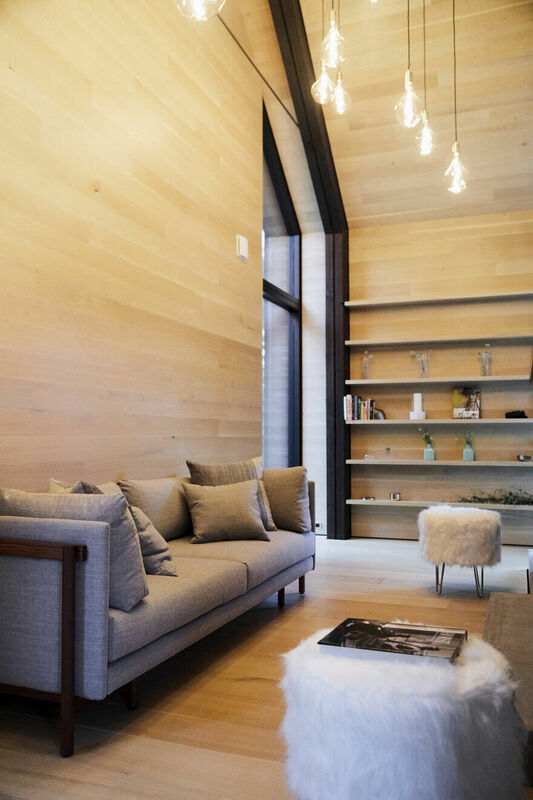 They also inspired the use of exposed structural framework, cathedral ceilings, loft spaces, large sliding glass doors, natural stone to the basement walls, wood lining to the interiors, and wood cladding to exterior walls and roofing. “The idea of living in a barn is romantic, idealistic, but totally unrealistic in this day and age. 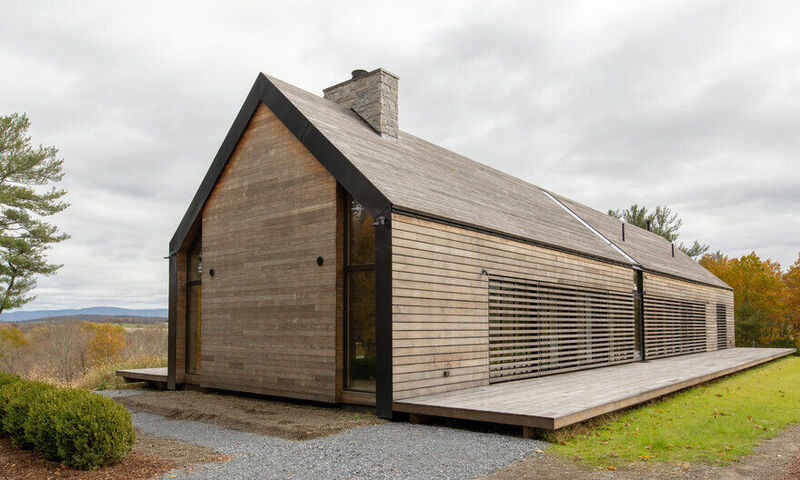 The key was to make a new barn-like structure livable.” explains Albury. The 100ft long main house structure is made up of fourteen repetitive ‘bent’ frames spaced at 8ft centers. These 22ft wide, 21ft high charred Douglas Fir frameworks were raised one-by-one from the horizontal and bolted upright into place within 5 hours. “Much like the traditional community barn-raising events of the past, the entire timber structure of the home was raised in one day” states Albury. 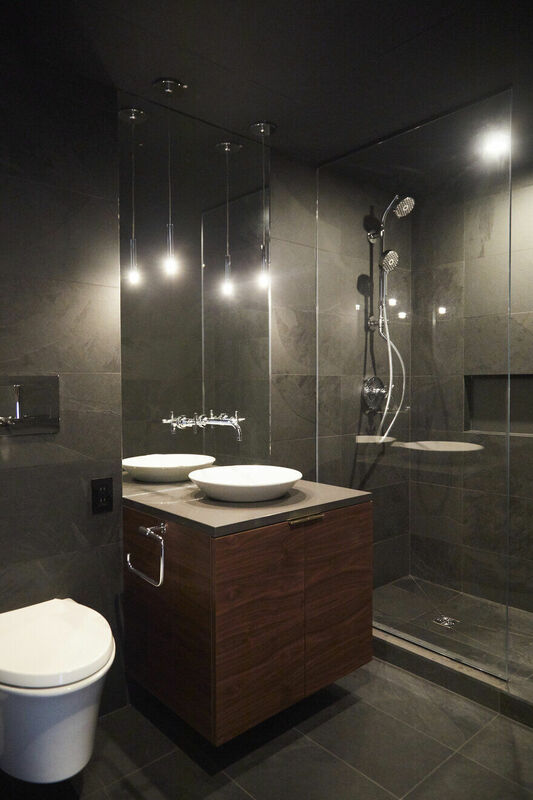 “From the very beginning the clients wanted a comfortable house. I believe it would have been irresponsible for me not to look at and ultimately follow Passive House standards.” says Albury. Specifically, the architects developed a high-performance facade of super-insulation, air-tight membranes, rain screens and triple glazing throughout. Adjustable exterior sunshading devices and in-wall heat-recovery ventilation units, help ensure an adaptable and comfortable interior environment, with continuous fresh air, year round. Operable windows and sliding doors are positioned to encourage cross-ventilation. Heating is provided with fireplaces and wood stoves, or with energy-efficient multi-split heat-pump air-conditioning systems. All appliances are electric. The house requires no fossil fuels. Artificial lighting is almost all LED. Downstairs, the underground wine cellar is completely passive and without the need for temperature control. Upstairs, daylighting is harvested by multiple skylights. The central skylight also brings light down into the basement. 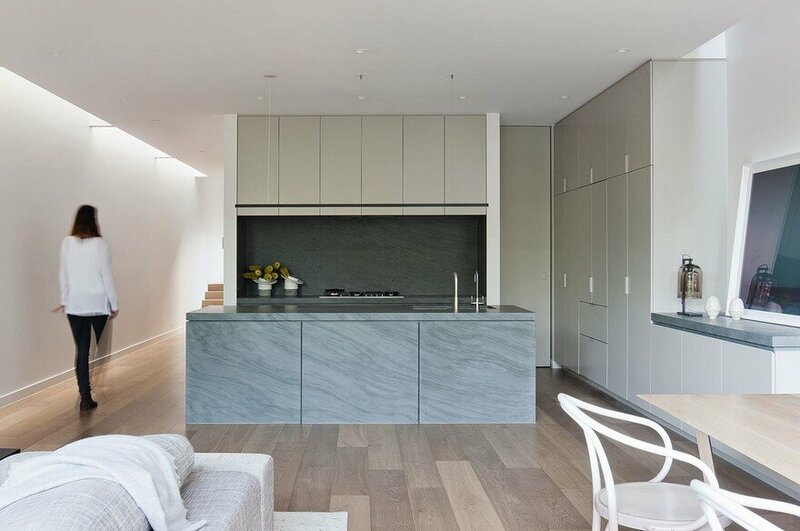 “As far as I’m aware, the home features the largest triple-glazed Passive House Certified residential skylight in North America.” notes Albury. The Silvernails house was designed and detailed with a 100 year time period in mind. “I felt fortunate to have clients that thought in generational terms. It was a mindset of longevity that I greatly appreciated” Albury states. All materials were selected to be durable, to age naturally over time, and need little, if any, maintenance. 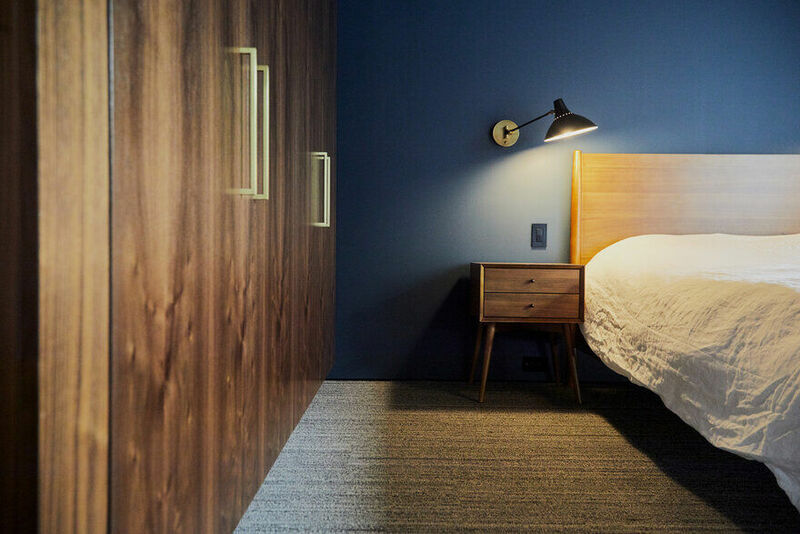 Rooms and spaces were designed to be adaptable and flexible, performing multiple functions as the family grows. The entire upstairs loft can be modified over time into nursery, play space, rumpus room, drawing room, or divided into distinct storage, study and office loft spaces as needed. Similarly, the upstairs loft space in the Carriage house was designed to allow future conversion into a guest house, with plumbing capped in place for a possible guest ensuite. Most design decisions and detailing were bolstered with multiple rationales and purposes. 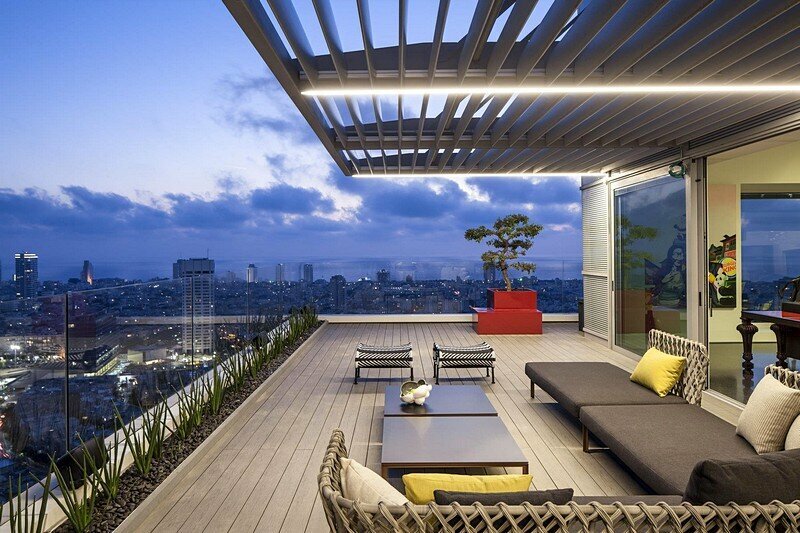 The south-facing facade sunshades help showcase this attitude of longevity, resilience, purposefulness and flexibility. These hand-operated, European engineered, finely detailed, pneumatic, tilt-up screens ostensively restrict solar gain during the warmer months. 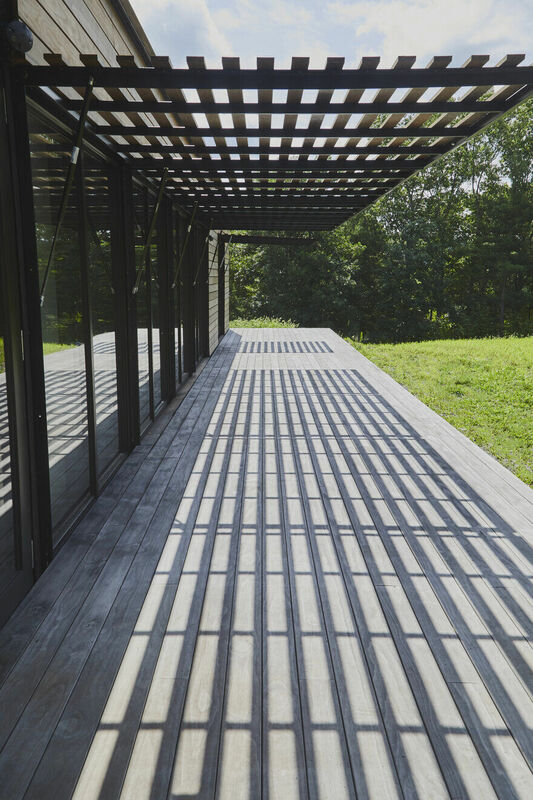 Additionally they create an ever-changing poetic play of sunlight and shadow throughout the day along the entire length of the house’s main corridor. 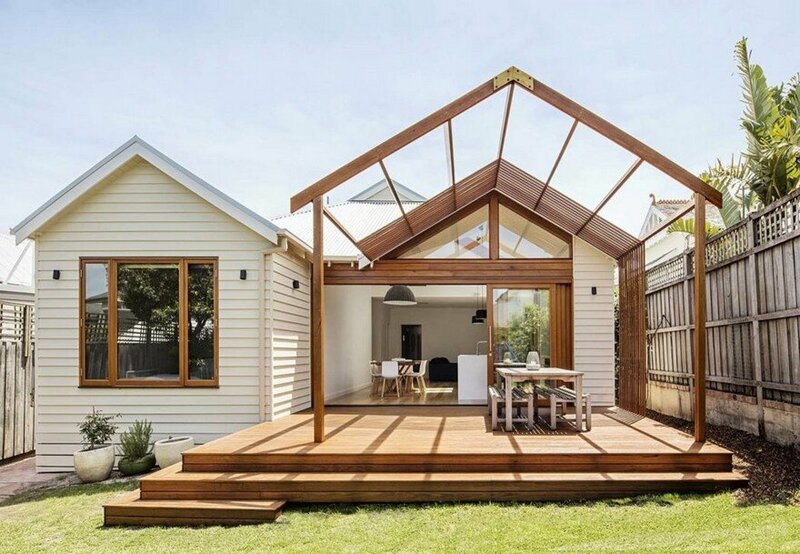 When opened completely upwards they provide shade for the expansive exterior deck, encouraging outdoor entertainment beneath, acting like a pergola or verandah. Conversely, kept open during cold months of low sun height, they allow for additional solar heat gain. In terms of resiliency, the shades, when closed down, act as hurricane shutters in the colder months against mini-tornadoes, nor-easters, polar vortexes, bomb-cyclones and other future severe inclement weather events related to climate change. If accidentally left open during a snowstorm they are designed to tip downwards under the weight of snow, cleverly shedding the snow in the process. 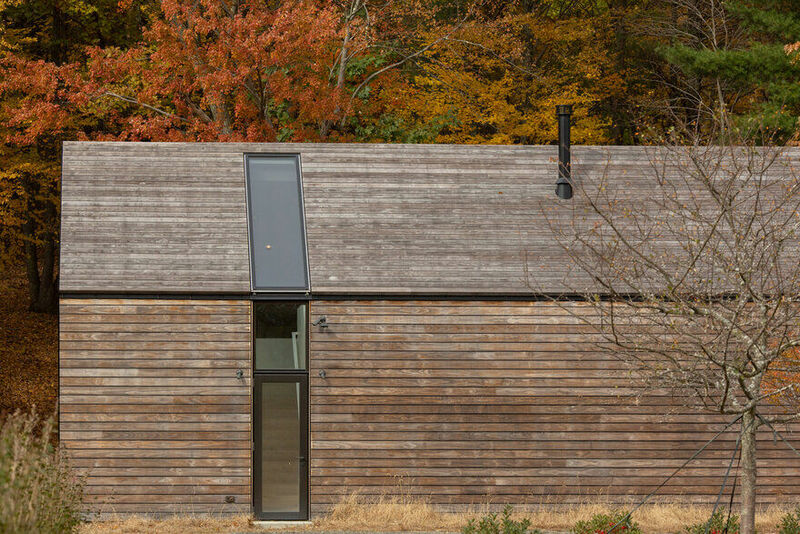 The cladding to the entire exterior, including the decking and roofing, is a new product to the US. Described as a sustainably sourced plantation pine modified with bio-based liquid, it exhibits hardwood characteristics. 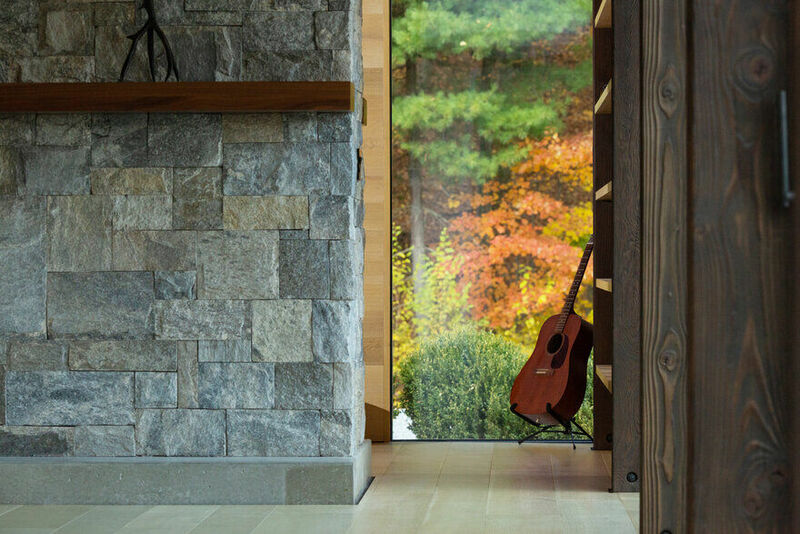 This hi-tech natural wood is maintenance-free, unpainted, unstained, insect and mold resistant, dimensionally stable and even warrantied for 30 years. 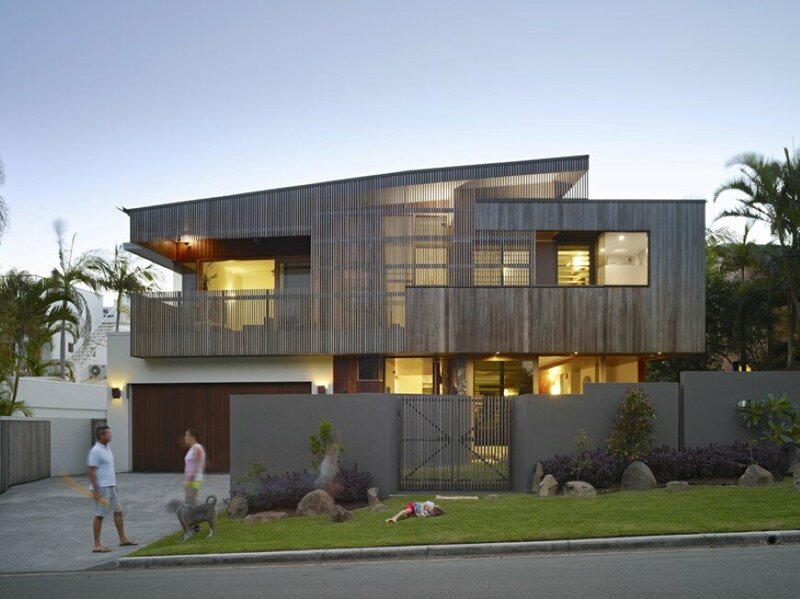 “It was applied as a rainscreen to all outside walls and also covers the roofs, using a unique, innovative clip system atop the standing seams of the metal roof sheeting – a first for a private home in North America” explains Albury. 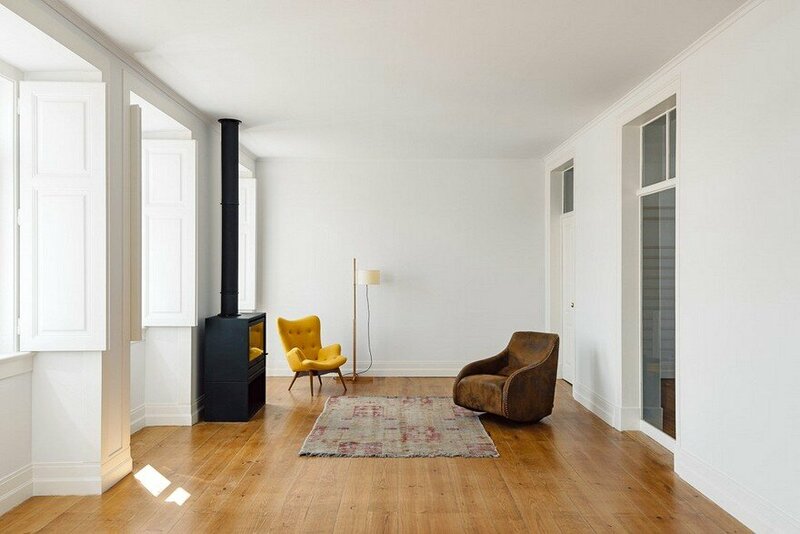 A clear focus on local materials informed interior finish selections. 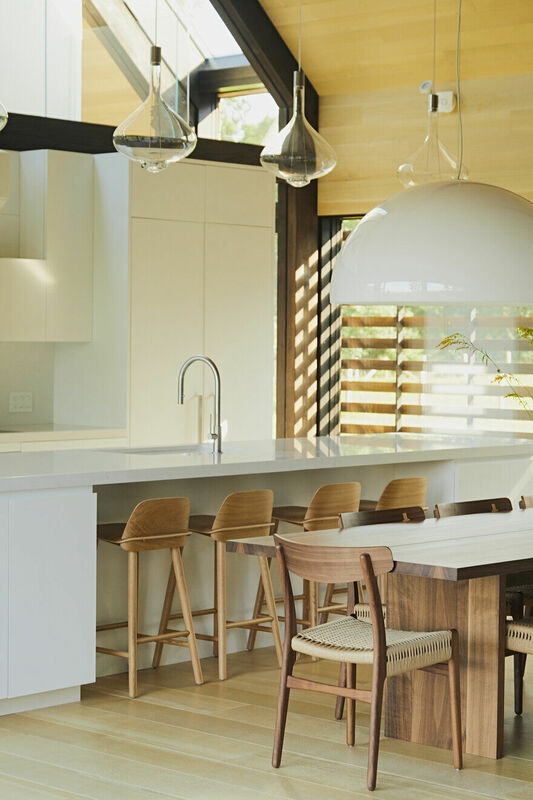 Tree species endemic to the heavily wooded 120 acre property were selected for warmth and character: white oak for flooring and lining, walnut for cabinetry, hickory for feature vanity units. Local granite, slate and domestic quarried stone guided choices for the chimney hearth, wet areas and basement masonry respectively. The palette progresses from the soft whiteness of the loft, to the clean warmth of the ground floor, to the raw, harder, elemental and darker spaces of the basement. Careful control of light and the framing of views were considered for each fenestration element. 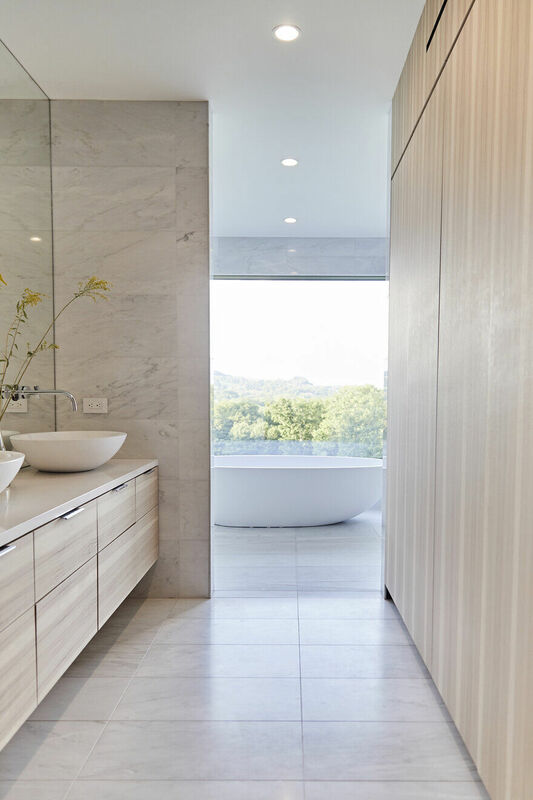 “The surrounding landscape is so beautiful and ever-changing, it was obvious the house design needed to celebrate this pristine scenery” states Albury. The fully glazed entrance and stairwell deliberately aligns with a mid-distant stand of pine trees: a favorite perch for a resident Bald Eagle. Four huge square-shaped lift & slide glass doors open up to the north and south decks for more expansive, 180 degree vistas, providing a strong connection between indoors and outdoors. Selective smaller, north-facing windows are detailed as picture-windows to maximize the expansive views out towards the distant hills and mountain ranges beyond. Additionally, bedroom window seats encourage active use and inspire further contentment, appreciation and contemplation of the outdoors, whilst being comfortably indoors. Private areas of the end bedrooms have unique full-height framed views down to the pristine trout-filled river waters of the Roeliff Jansen Kill. Horizontal basement windows are at a high-level emphasizing the wild flower meadows stretching beyond. Tall, slanting north-facing skylights in the upstairs loft become optimal stargazing portals on a clear-sky night. The main galleria corridor running the length of the house frames vertical views of nearby deciduous oak woodlands at either end. But perhaps it’s the line of south-facing 8ft high windows and French-doors employing the adjustable exterior sunshades that offers the house’s highlight of dramatic light control and shadow-play: “Ultimately, it’s a house that plays with light” summarizes Albury.